The moment at which a sporting event is lifted from the mundane is in that instant when what is at stake is no longer a single match but the possibility of a different social organisation. 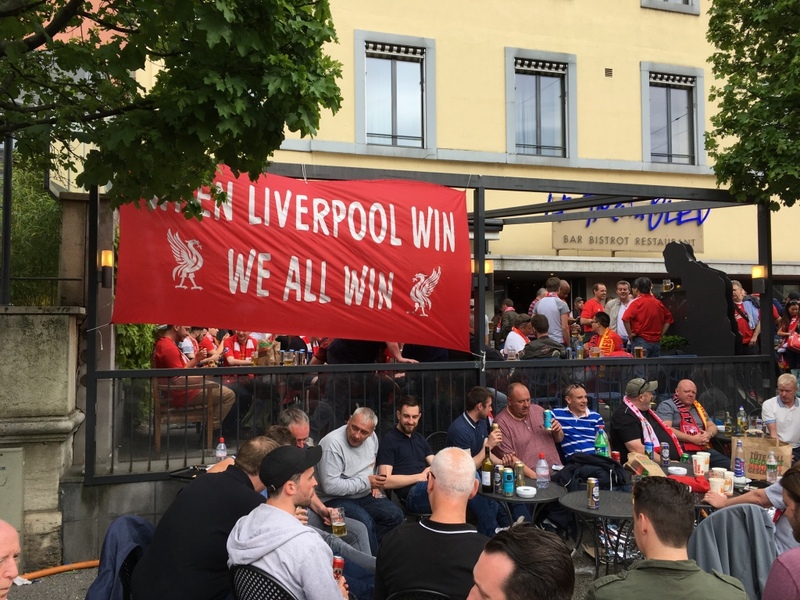 It was in this spirit that I travelled to Basel on Wednesday, with my friend Gareth Edwards, to explore the rebuke that Liverpool’s manager Jürgen Klopp offers to the accepted way of doing football in England. The script will be familiar to many readers already. First, in contrast to the usual tactical orthodoxy here which focuses on the position of teams in attack (442, 4321) and assumes that teams form the same shapes in both attack and defence (therefore a 451 will see more of the ball in midfield than a 442 team, etc), Klopp is principally interested in defensive shape, arguing that much of any team’s attacking threat will come about from attacks generated by the fast turnover of possession in the opposition’s half. Second, to achieve the intended onslaught on the opponent’s game in possession, Klopp promotes attackers and attacking midfielders who are capable of running themselves into the ground. So, Klopp deliberately made no permanent transfers in the January window, arguing that he would rather see what his predecessor Brendan Rogers’s players were capable of rather than simply buying replacements. If Kloppism means anything it is that a well-coached side should be capable of beating an expensively-assembled one. Neoliberalism take note … it’s not always about the money. Getting to Basel proved a challenge in itself. Avoiding planes on environmental grounds, we bought tickets on the Eurostar. Then, with less than a week to go till the game, the CGT announced a general rail strike in France. The plane it had to be. At Zurich, we met airport workers who clapped us on the back and promised they’d be watching that night. In Basel, we were part of a large crowd that was marched out of the city centre, without transport, through hours of rain. “Is there a bar in the stadium?” I asked one of the guards. He looked to his friend for translation, complaining about my “schwer dialekt”. God knows what he made of actual Scousers. Those who watched the game will know that many more Liverpool fans travelled and that we dominated around 3/4 of the ground. It felt like a home game and Sevilla are poor travellers (having failed to win all season away from home in the Spanish league). The first 45 minutes saw Liverpool in control and 1-0 ahead having had enough chances to go two or three up. Liverpool ultimately lost 3-1. There was a twenty-five minute period when Liverpool were overrun in midfield, with the team’s shape lost and without the cover to protect in the area between centre and right midfield (James Milner playing in between these two positions). Sevilla had 4 shots on goal in this period and scored from 3 of them. Klopp solved the main tactical problem by introducing Joe Allen, but by then the team were behind and at no stage in the second half did they have any real period of pressure. Klopp’s playing style is at its best against teams which try to hold the ball in defence. In the German league, teams tried to escape the Klopp press by playing long balls over Dortmund’s defence. This tactic then travelled to England when Klopp arrived. While, in general, Liverpool did poorly in the league this season with fatigue being a common explanation (Liverpool played 20 more games all season than for example Leicester), tiredness did not express itself evenly. Klopp’s Liverpool did relatively well against the top teams (with wins against City, Chelsea, draws against Arsenal, etc) but suffered against “long ball” teams. Indeed this problem was repeated in the UEFA cup final. In order to cut out the long balls, Liverpool need more height and more physical presence in midfield and defence than the likes of Allen, Milner, Lallana, Lucas and Moreno can provide – and while you can coach skill, you can’t coach presence. The Klopp revolution, when it comes, won’t be pure but will involve at least some key acquisitions. Klopp himself may be the most articulate voice arguing against football’s cash obsession. But that doesn’t mean that the Klopp team is yet capable of performing at the level he wants. If Kloppism was to become a general term to describe the virtues of the cash-underdog, then in this game Sevilla were the underdog (the players having been bought for rather less than Brendan Rogers’ Liverpool) and in the 2015-2016 Premiership Leicester did more for Kloppism than Klopp’s Liverpool achieved. Finally, as for the fans. It was a privilege to be stood with them and to be part of the crowd. My sense is that even as late as the 86th minute, the supporters still thought a Liverpool victory was possible. We were ahead of the team in the first half, and we sung in the second half as much as the team allowed them to (which wasn’t much at all). Klopp has been criticised by some pundits for trying to rouse the crowd, as well as the players, in the second half. But I won’t criticise him. He has reached, through his own route, the same belief in the link between the crowd and the team that the greatest of Liverpool managers once had. Hard as the loss was to accept, the future is still Red.